Oh my goodness!!!! Could these look anymore delicious!? They make excellent bribes 😉 And thank you for the compliment, I’m slightly obsessed with photography lately. Oh I love mounds. . .and chocolate cupcakes! What a yummy combination. Yum! I love coconut and these look deliciious! 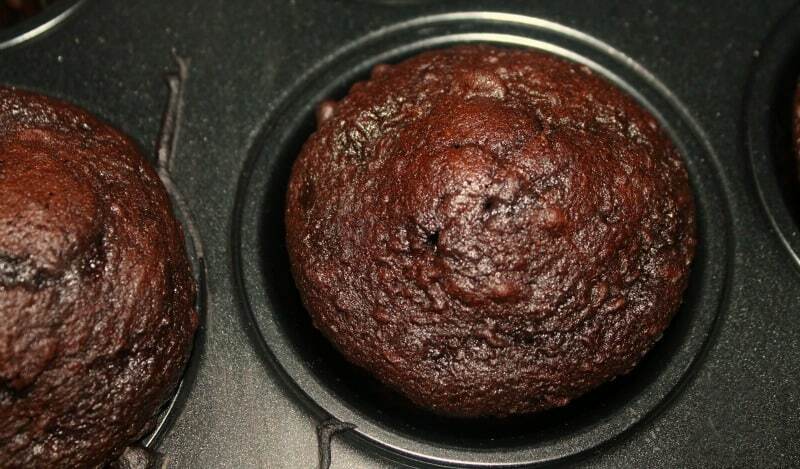 Baking cupcakes is one of my favorite ‘zen’ things to do…but combined with my favorite flavor (Mounds! ), I’ll be in heaven! I can’t wait to try these!! My Mom loves coconut – the next time they’re here to visit I’ll have to make some for her! I think I’d like them filled with coconut-flavored frosting (I have a texture thing when it comes to regular coconut!). That should work too! My son is the exact same way, this softens the coconut a bit but it still has a little “bite”. Oh my goodness. These cupcakes look divine! This is sooo yummy, Oh My Goodness! I’m pinning this and probably framing your pictures! Looks delicious! Must. Have. Now! I think I just caught some drool on the side of my mouth. Before I found out about my food allergies, specifically a severe coconut allergy, mounds were my favorite candy. I so wish I could try these. They look and sound AMAZING! I’m not a huge fan of coconut, but that chocolate frosting drizzled down the side of these cupcakes just makes me want to lick the screen! These are a just try Amber! Thanks so much for sharing. Oh wow….the coconut filling looks absolutely delicious with the dark chocolate cake and frosting – yummy! Oh wow these look so sinfully delicious. Love mounds, so I know these would be a hit. Thanks for sharing at Simple Supper Tuesday. These look absolutely divine!! Thanks so much for the recipe. I am visiting from Proverbs 31. YUM!!! Thanks for sharing on Sweet Sharing Monday! I just booked marked this! What a great recipe. Thank you for sharing it on our Four Seasons Blog Hop. Pinning now. I can’t wait to try this recipe and share it with my sister when she comes down. Thank you for sharing it on our Four Seasons Blog Hop. Pinning now. Yummy! Love the coconut centres. Thanks for sharing on the Monday Parenting Pin it party. These look so delicious. I don’t know if I can wait until Valentine’s Day! Thanks for linking to the In and Out of the Kitchen Link Party. Hope to see you next week. Your Mound Cupcakes are fantastic, we will just love this special treat. Thank you so much for sharing with Full Plate Thursday and have a wonderful week! These look like they would be a real treat! Thanks for sharing this recipe with us at the Four Seasons Blog Hop. I will be pinning this to my Valentine’s board!! These look so good that I made them today’s Dare to Share Feature of the Day. Thank you so much for linking up! Love mounds… amazing. these would truly be a valentines day treat come true. thanks for bringing them to foodie friday. Oh!!! You totally got me with this one! I love coconut and chocolate! You are a Fabulous Feature this week! Stop by and grab a button tonight 🙂 Thanks so much for sharing! Um…. hello, Mounds and Almond Joy are two of my fave candy bars EVER. Thanks SO much for sharing these at our Best Of The Weekend party last week!! I featured them when the party went live tonight so come grab a “featured” button off my sidebar if you would like and we can’t wait to see you back at the party. Have a great weekend! Your pictures make me want to take a huge bite!! They look so yummy! Thanks for stopping by Saturday Dishes Valentine’s blog hop and linking this up. I pinned it! I never thought of adapting mounds as cupcakes, but I cannot wait to try this recipe! Thanks. Not a fan of mounds to be honest,do not like coconut BUT do have family who would love to try this! looks pretty simple too! OMG! My hubby loves Mounds bars. I printed the recipe and will make them for him. I bet he will love them! oh my gosh! I’m drooling all over my keyboard those look so good! oh my..mounds one of my fave candies..will pin this one..a keeper..will make for Christmas for sure..thanks. Oooooooh……….two of my favorite flavors – coconut and chocolate! This is a must make recipe! Thanks! These have everything I love in them!! Not a mounds fan but I need the contest entry! These look great, mounds are one of my favorite candy bars! Thanks for sharing! These look so good. I must make these. I bet that coconut filling is wonderful!! Thank you so much for adding the print option! I’m totally going to make these! Mounds are my FAVORITE candy bar! Interesting recipe. I’m not a fan of Mounds Bars but my hubby loves them! I can’t wait to make them for him and I think I might actually like them too. Thank you! I have loved all you recipes so far. This for sure. all that chocolate.. I love coconut and I love mounds. I could never make these because I would end up eating way too many. These are so pretty! And, look at the wonderful surprise in the center! Wow! That looks delicious. Thanks for sharing! WHAT??? You are blowing my mind with this recipe. That is so cool. I love anything coconut like mounds…..sweet!! Thanks! OMG! These look heavenly. I am making these for sure. Mounds are my favorite! You had me at dark chocolate cupcakes……………mmmm. I love Mounds and these look so delicious. You could make almond joy ones by adding chopped almonds to either the filling or frosting. Oh these look very fancy and yummy!!!!!!!!! my son would love this,mounds is one of his favorite candies. I am allergic to coconutsa but my parents love it! I will be sure to pass this recipe on to my mom! I’m allergic to coconut, but my mom loves it. Will pass the recipe along to her. These sound good. I love coconut and would love to try these. These would be great with a scoop of ice cream. Yummy! Oh these look heavenly and mounds are my most favorite candy bar. I however am on a strict candida diet and can’t have sugar and gluten but I have been experimenting with gluten free and sugar free products. I might try to make something similar that I can have. Thanks for the inspiration. These recipes are making me hungry. I love sweets and I am being tortured right now. Oh my stars! Yum!! I wonder if I could talk my daughter into them up for her momma, lol. Wow! This recipe sounds incredible! I have got to make these!!! All of these recipes are making me so hungry right now!! I use to hate coconut, but I’ve been liking quite a few recipes with it in. These cupcakes look so yummy!! I might have to make these also!! I can’t wait to go to the store & buy the ingredients to make these…look delicious! My favorite candy in a cupcake! I’m going to make these tonight! I can’t wait! I highly dislike coconut, but my husband would love these!! I haven’t had a Mounds bar in years, but these cupcakes look delicious. Not sure about these, but will give it a try. I’m not a big fan of mounds. I probably would still make them though. Looks yum! The coconut in the middle is making me drool! My daughter would love these! Great valentines day recipe! My husband loves coconut.. I have to make these! I would love to make these for friends birthday. I’m going to make this recipe, can’t wait! Oh yum! Gotta make these! so much fun to make huh! You had me at the word Mounds. Love the candy bar, and I’m sure I’ll like these. Pinning it now. Sometimes you feel like a nut, sometimes you don’t! these look YUM! My husband and I both have a sweet tooth. We love deserts like this. Yum!!! I LOVE MOUNDS candy, coconut and dark chocolate are a wonderful mix. Thank you so much for sharing this recipe!!! Mounds are my favorite candy bar. Having them in cupcake form would be pure bliss. These would be good for my daughter’s birthday this month for her class. These look awesome and so mouth watering good. You are making me hungry!! These look absolutely delicious! I love Mounds candy bars. The coconut filling looks so wonderful and it doesn’t sound as hard as I thought it would be to fill them. 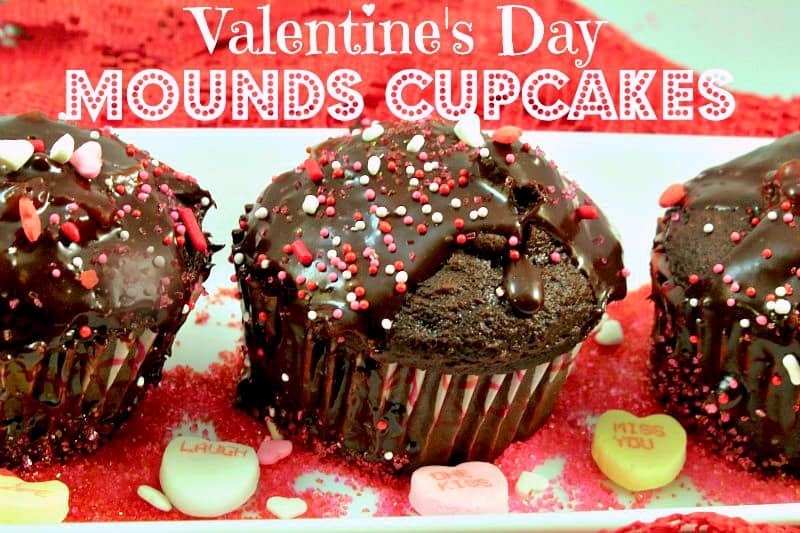 I so love Mounds and really want to try these cupcakes. One of my favorite things to bake is cupcakes and my husband loves Mounds. So I will have to make him some of these. Oh my goodness, my best friend loves mounds-I must make these for her. I’m not going to tell her about them until I make them this weekend and surprise her with them. This has made my day. Thanks so much. I have never seen this before, yum I will make these! Oh, man, these look.Yummy! My mom.would love these, she loves coconut! Havetotrythese! OMG! I love Mounds! Will definitely have to make these! I love this recipe can’t wait to try it. Cute and Yummy at the same time whats not to love! I’ve never had a cake recipe with coconut in the middle! Yummo! I love coconut, so these look so good! I think I’m going to make these for my husband for Valentine’s Day! Mounds cupcakes OMG!!! 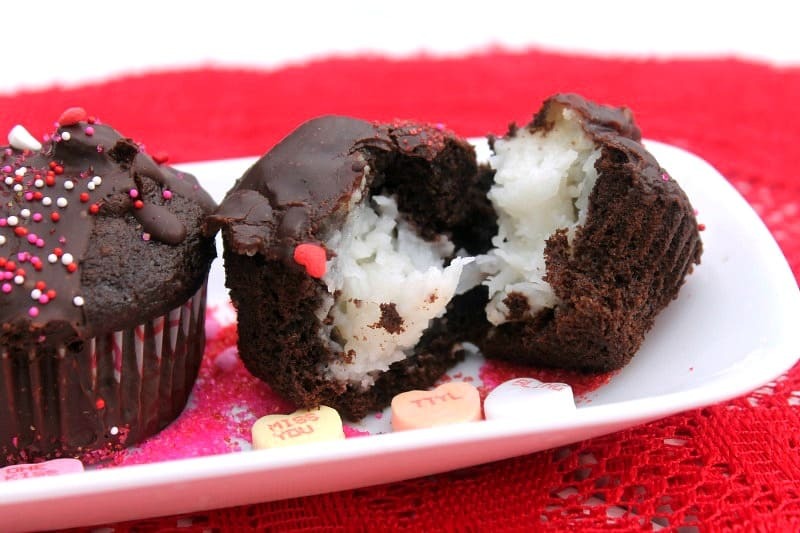 My husband doesn’t like coconut so can I make these for myself for valentines day ?!!! These look and sound delicious!!! These look heavenly! Love anything with coconut! Those look so awesome and gooey! I love gooey chocolate foods. I really like how they have fillings,too! I’ve never had a cupcake with something inside, before! I will be trying this soon this is my hubby’s favorite candy bar. Oh my, these look to die for! OMG WHERE DO YOU FIND THIS STUFF. I’m going to gain 20lbs. not a fan of coconut! But I am loving the dark chocolate! Actually, my mother would love this recipe! OMG… my mouth is watering now. Must have these cupcakes… asap!! I love chocolate but not coconut. These look delicious and so rich! I like the mounds candy bar the cupcake looks so delicious. These look wonderful, especially the topping! Thanks for the recipe! OMG these look and sound wonderful!!! Thank you for sharing, can’t wait to try!! Awesome! Those really look good. This is a recipe that I will definitely be making, I have coconut lovers in my house.